MedSpark, a San Luis Obispo based biomedical engineering company, is currently seeking a part-time/contract highly-skilled machinist to produce device prototypes. MedSpark improves the quality of people’s lives through collaboration with medical professionals to bring their product ideas to life. 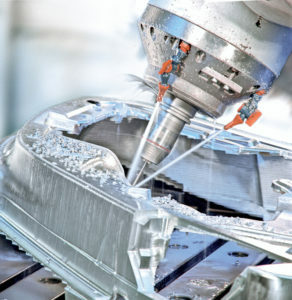 The variable quantity of work and times available to perform said work would be ideal for a CNC machinist who has existing employment, and who wishes to earn some additional money on the side. Work hours and days are extremely flexible, based on need and your availability. Fabricate Prototypes from a Wide Range of Materials. Understand Complex Manufacturing Drawings, Tolerance Stack-Ups, GD&T, and Written/Oral Communication. Independently Program, Setup, and Operate CNC Mill (3 and 4-axis), CNC Lathe, and 5-Axis Wire EDM. Anticipate and Solve Potential Tooling and Design Issues to Improve Manufacturability and Efficiency. Research, Identify, and Select Materials, Tooling, Cutters, Components, and Assembly/Fabrication Processes. Maintain Cleanliness of Machines and Work Areas. – CNC Machining (Lathe, Vertical Mill, and Wire EDM). – Machine Setup and Fixturing. – Conventional Machining (Lathe and Vertical Mill). Detail Orientated, Precise and Accurate. Strong Initiative with Ability to Independently Develop and Execute Complicated Manufacturing Plans. 10+ Years’ Experience in the Field. Highly Experienced Programming for Lathe, Mill, and Wire-EDM. Operation of Various Manufacturing Equipment (Injection Molding, Compression Molding, Vacuum forming, TIG Welding, Oven Heat Treating, 3D Laser Scanner). Experience with Milltronics Centurion CNC (Lathe and Mill), Charmilles Robofil Wire EDM, Chmer EDM Hole Popper, and 4/5-Axis Milling. Properly Tolerancing, Machining, and Assembling Shrink Fits (Oven/Liquid Nitrogen). Candidates who provide a detailed visual portfolio of previous professional, personal, and/or academic machining/manufacturing projects will be considered first.